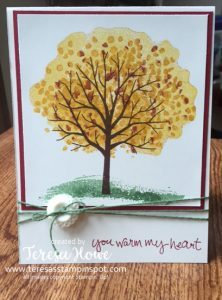 Yes, I know – another tree card – but this one is a little bit different – so hopefully you’ll love it as much as I do. Recessed panel cards have been popping up on some of the demonstrator sites I follow and I decided to give it a try. Most of the versions I have seen have Designer Series Paper as the recessed panel and a die cut crossing over the top of the panel. While they are pretty – I wanted to give my own little spin and stamp my panel instead. I sponged my background – Garden Green for the ground and a mix of Crushed Curry, Pink Pirouette and Pumpkin Pie for the sky (was going for a setting sun look – but think I went a little too much with the Pumpkin Pie). Still pretty – but I think I could do better. 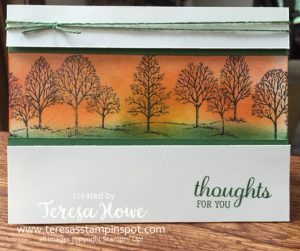 The trees are from the classic Lovely as A Tree – I stamped the trees in the center first, then shifted to the left and right to fill in the entire panel. The sentiment is from the Best Birds set – I really love the font in this set. I do have an idea for another card – but the supplies aren’t here yet (they are on their way, tho!) – so you’ll probably see that one in a week or so. New specials start today! Save 25% on these products!